Books being made into films are the money tree for the majority of Hollywood. Millions of pounds have been made in the movie scene thanks to the likes of the Harry Potter franchise, The Lord of the Rings trilogy and The Hobbit. Books being made into games though are a rarer thing. We may well have seen many that inspire a game, like the Metro trilogy, but here with The Pillars of the Earth things are different. This is a reimagining of a huge Ken Follett novel that was released in 1989 – one that gained critical and commercial acclaim. So does the videogame version of it excite like a thriller that you can’t put down on holiday, or is it more like the 1874-1974 accounting ledger for a paper mill? 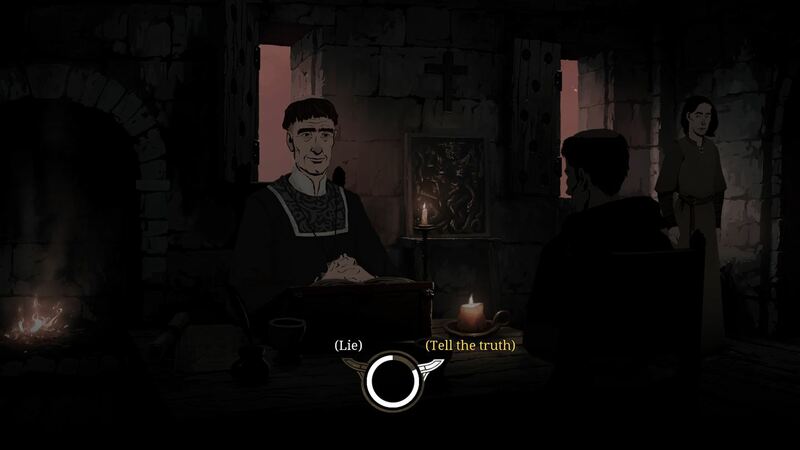 Ken Follett’s The Pillars of the Earth – to give it its full name – is a ‘point and click’ adventure where you have to make serious choices and decide the course of action for your heroes. The story follows many different protagonists through three huge books of gameplay, creating an epic journey through time. Set in the 12th century with a mixture of fictional locations and real ones, the action first takes place in the town of Shiring and the priory of Knightsbridge. England is in a mess with factions fighting for power, with backstabbing, feuding and power grabbing all creating a heady mix. We start with the prologue, which concentrates on a family comprising of a master builder, Tom, his wife, daughter, and son – they are down on their luck fighting to survive in the woods in deep winter. After a tragic event, they are found by a young boy, Jack, and his mum Ellen, who are mysterious hermits living in the woods. They join the family and find themselves in the town of Shiring when they meet the daughter of the Earl. Meanwhile, Phillip, a monk, visits the priory of Knightsbridge to reveal some dark truths about upcoming events that will change everything politically in this region and the country. All their destinies are entwined and we visit these characters both separately, and together, throughout the course of the three books. The characters grow old, go through life-changing events and you travel with them across Europe and the south of England. As you would probably expect, the story is where the game really holds up and it delivers big emotional and narrative punches. As you can imagine, the thrust of the narrative is an epic one and it feels like you’ve gone through five seasons of your favourite TV show by the end of it. The story can be compared slightly to Game of Thrones with its twists and turns and political ambitions, but there is no magic… or dragons of course. It’s a complicated historical drama that deals with religion, power, architecture, and love. For yes, there is a love story underneath all the other moments of bleakness and they tell that heartfelt story very well indeed. There is a moment when, in Book Two, the lead character is stuck in a loveless marriage and the camera stays with her in the kitchen as time goes by. It really plays with the heartstrings and the long-haul storyline of the game. But enough of all this literature malarky, where is the gaming I hear you shout! Well, the game plays like a normal point and click adventure, much in the vein of a Broken Sword or Telltale game. You move around the screen and can pick up items, interact with the characters and look at the surroundings. There are dialogue trees galore, with some interesting choices and deep effects on the outcome of the game. It has a nice easy UI for using an item, one that is the best I’ve seen in a game of this genre, and it all works well, even though sometimes it’s easy to miss an interactive point when it gets a bit busy on screen. There are a number of small mini-games which see you basically trying to hit an area on a bar with a fast-moving cursor. The one big problem with the gameplay and dialogue is that by Book Two pacing becomes a major issue and there are certain scenes that could have been cut or energised in order for the game not to drag so much in places. 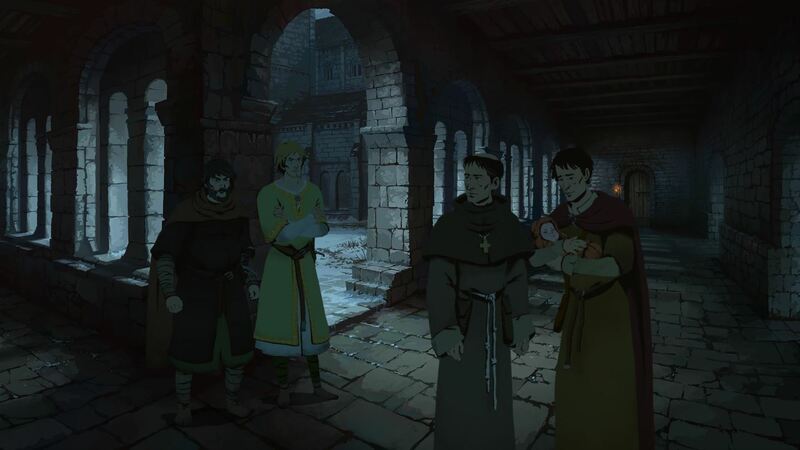 But The Pillars of the Earth looks great, with its cartoon artwork much like some of the amazing work done by animators on films like Watership Down in the ’70s and ’80s, or most recently in The Banner Saga games. The skies, buildings, and locations all look authentic and it builds a superb atmosphere and backdrop throughout the whole game. A special mention has to go to the little journeys your characters take, which is done in a ‘choose your adventure’ way. In the sound department, you have a great score, effects and musical numbers, along with monks singing latin hymns, which is beautiful. The voiceover work is excellent with some great performances and a good range of talent. 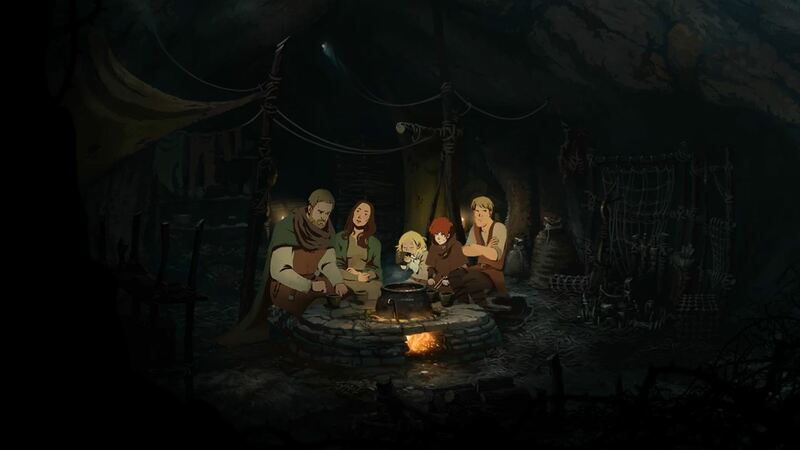 Overall if you are a point and click fan who loves a good story then Ken Follett’s The Pillars of the Earth is a must purchase for you. But be warned, this is all about story and character, without QTE fight scenes and any supernatural powers. The game is lengthy as well, and with that comes some saggy pacing issues. Saying that though, I’ve really enjoyed my time with this major saga and feel like it sits in a unique place in the current gaming arena. Books into games? I like it.